Local produce, eat it part. 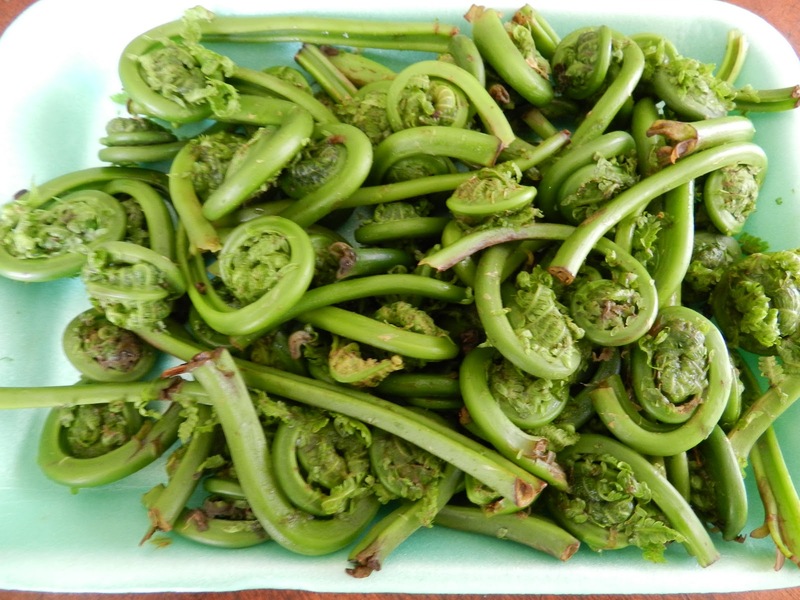 There are a lot of wonderful selections of produce at my local market and of course, the farmer’s market which have many seasonal products including fiddleheads. For those unfamiliar with fiddleheads, it is a fern… it is seasonal and it is not cultivated but you can find canned fiddleheads, or previously frozen ones if you cannot purchase it fresh. This next recipe is great for overabundance of summer time harvest from the same author and cookbook. You can use the recipe for other fruits and vegetables as well. 1. Peel the tomatoes. Cut them in half and scoop out the seeds. Line a baking sheet with aluminum foil and turn the oven to 175 degree F, or a little higher. 3. Turn the sheet back to front and see how the tomatoes are doing. You have several choices about determining doneness. If you just want to intensify the tomato flavor and use them immediately, they’re done when still soft but somewhat shriveled, 2-3 hours total. If you want to keep them for a few days, they’re done when they’re shriveled and mostly dry, at least 4 hours total (wrap and refrigerate). If you want to keep them for weeks (Yay!~ee), they’re done when they’re dark, shriveled, and dry, 6 or more hours total . Then wrap and refrigerate, or store in a jar in the pantry. I love fiddleheads! Awesome in salads and stir fries. They are great and very nutritious. We help Maryland residents grow! Learn timely tips to manage your lawn, ornamental plants, and food gardens, with advice from University of Maryland experts and certified horticulturists. Soils Matter, Get the Scoop!